Back in 1824 John Cadbury (see left) opened a grocery shop in Birmingham's Bull Street, in what was then a fashionable and prosperous area. But John was no ordinary shopkeeper. He was a devout Quaker involved in the early anti-slavery movement. He was a campaigner for social reform hoping to end poverty and deprivation. 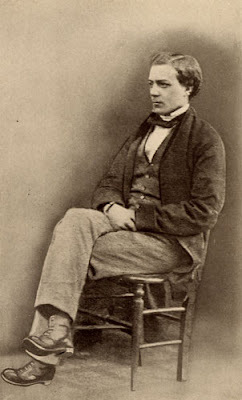 Being a member of the Temperance Society he sold non-alcoholic beverages and, as a sideline, John produced his own brand of drinking chocolate - a beverage then popular across Europe, though still very much a luxury afforded only by the rich. 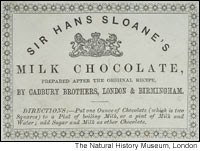 With beans imported from South or Central America, John used his own pestle and mortar to grind them up and produce 'the block' from which the chocolate could then be scraped before being added to hot water or milk - as advised in a recipe dating back to the 1600's, brought to England by the doctor Sir Hans Sloane who himself had been introduced to the drink while travelling in Jamaica. 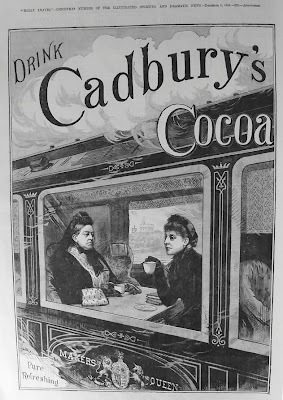 Advertisement showing Queen Victoria drinking Cadbury's Cocoa - a royal warrant for the product was awarded in 1854. Soon John's brother Benjamin joined him as a partner. A factory was rented to enable mass production, and when the government took the step of lowering import duties the luxury of Cadbury's chocolate was affordable for everyone. By 1861 when John was suffering from ill health the business was taken over by his two sons, Richard and George - the latter then visiting Holland and purchasing a cocoa press, a new and far more efficient method of extracting the fat from the beans. 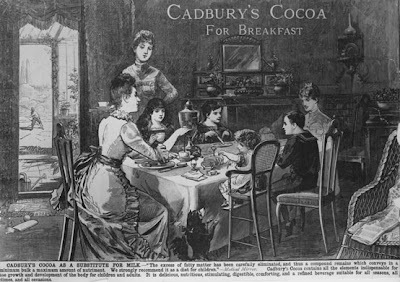 In 1866, Cadbury's 'Cocoa Essence' was launched, acclaimed as being 'Absolutely pure - therefore best.' Many more adverts followed on extolling the purity of the product, along with its health-giving properties. Campaigns often featured virile sportsmen such as golfers and rugby players - or the handsome mustachioed rower below. 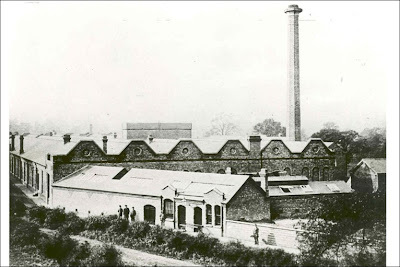 The company continued to prosper and by 1878 several acres of land had been purchased on the outskirts of Birmingham. Known as the Bournbrook Estate this was to be the home of the new Cadbury's Bournville factory. But it was not until 1897 that the first milk chocolate bar was manufactured - the recipe created by adding dried milk powder to cocoa solids, cocoa butter and sugar. Whatever the success and expansion the company founder's firm beliefs in principled capitalism were not to be forgotten. Cadbury's philanthropic ambitions were diligently retained, all factory workers treated with respect, and those who worked on the Bournville estate offered housing and education, even medical care and pension schemes. No doubt that is why there was such debate with regard to Kraft's recent take-over bid- and whatever one's view on that matter could the Victorian John Cadbury ever have imagined that the grocery shop he once opened up would result in a business empire valued at £11.9 billion and employing a global workforce of 45,000 staff? What a fascinating history! I had no idea about Cadbury and Kraft... it's amazing how the business world is constantly changing in so many subtle and big ways. Cadbury isn't as big over here in the States but I've always been a big fan. I just had no idea of the history behind it. The advertisements are clever, my favorite being the gallant rower! Thank you Neo-Victorianist, and Stephanie. 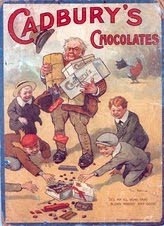 The story was headline news here for a few days, partly because of another British company being sold to foreign owners, and partly because of the historical importance of the Cadbury's ethical business model. What a great post and what an iconic company. Where would we be without proper cadburys chocolate?! Well, probably would be need to be at the gym less, but nonetheless a fascinating story. Many thanks, Gentleman Administrator. That made me laugh,and how true! I consume a family-sized Cadbury's Whole nut bar on a regular basis, and years ago not a day would go by when I didn't eat at least one Double Decker - which was Cadbury's again! 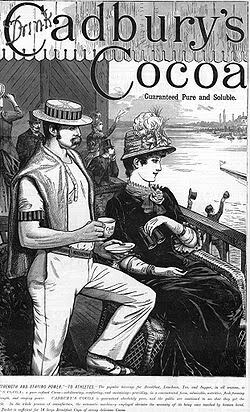 Good to hear that The VV is not only a terrific source of information about Victoriana but also a chocaholic. That's two pleasures we share. Not lowering the tone at all, Bill - I think a valid point of discussion. I love your posts. They are always so interesting. I really am sorry Cadbury's is going to be swallowed up by Kraft. Nothing good comes of American takeovers, usually. Hoping this will prove to be the exception. I love Cadbury's chocolate especially Bournville dark chocolate. I make a beeline for it whenever I am home! Hello, Ann - thanks so much for the kind words. Cadbury's was my favourite chocolate. I live in Dunedin, New Zealand and we have our own Cadbury's factory. Many times I've gorged myself on 'scrap' chocolate from a friend who worked there. But sadly, since the takeover, it just doesn't taste the same. Many of my friends and myself have changed brands.Has it changed over there in England too? I love Cadbury's chocolates. Although I haven't tried their chocolate drinks. The history and their success is really rich. Thanks for sharing it was really informative.